The u/12 Danone Nations Cup also celebrates it’s 20th edition, so is the Danone group that also turn 100 this year. A milestone indeed. 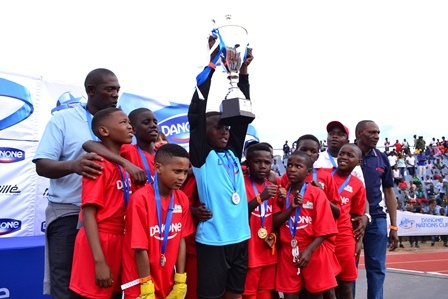 Danone Nations Cup 2018 -SA winners Nomlinganiselo Primary School from Nyanga Location (Western Cape). Other schools have been encouraged to register for this special tourney that could see them playing in Barcelona against top countries. Being one of the biggest tournaments in the world with over 2million young lives affected, for SA, the registration has opened for Primary Schools to enter this exceptional competition, that boast top star signature such as Zinedine “Zouzo” Zidane- former Real Madrid player and coach. To mark this special year, it has been decided that the 2018 and 2019 editions of the tournament will be held simultaneously. “It’s a privilege for Danone to be involved in this prestigious tournament,” said Chantel Ehlers, Internal Communications Manager, Danone Southern Africa. “Over the past 20 years the tournament has inspired millions of youngsters around the world to believe in their dreams and develop healthy eating habits that will benefit them throughout their lives. The tournament is run under the auspices of the South African Schools Football Association (SASFA) who collate registration forms, finalise dates and fixtures and manage the games at cluster, regional, provincial and national level. Games will kick-off at cluster level in March culminating in the national finals to be held at a venue to be decided, in June or July. The World Finals are expected to take place in early October (dates to be confirmed). Mzansi has much to celebrate with the country being only one of two to have won the tournament three times (2003, 2007 and 2009); in 2006 the country was named the best attacking team and produced the top goal scorer. In 2008 South Africa won the Team Spirit Award and in 2013 and 2016 the teams were recognised by the Department of Sports and Recreation as the Best Development Team in the country. With schools calender having begun, interested schools can register for the competition by contacting the national coordinator at the SA Schools Football Association (SASFA), Themba Tshabalala, thembatshabalala@saschoolsfa.co.za or on 011 403 2844, 084 290 0602 or 072 588 4957. Alternatively, they can visit the Danone Nations Cup South Africa Facebook page or go to www.facebook.com/dncsouthafrica to download the necessary documents. (Documents are always on Danone.co.za).